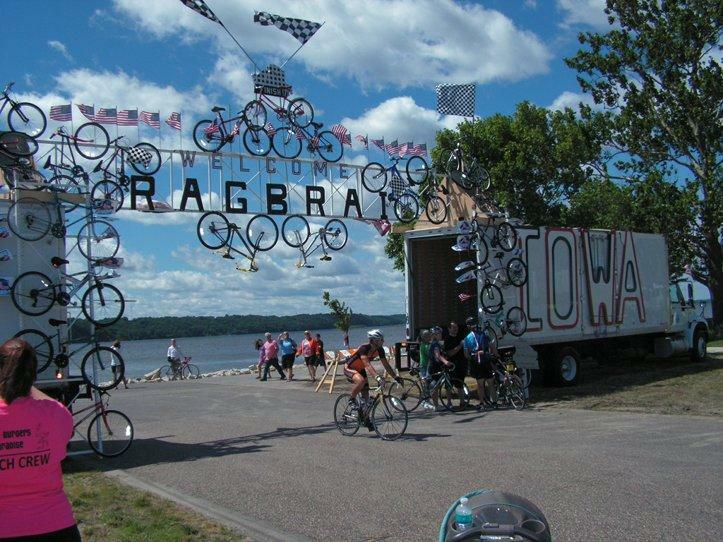 The Gateway for the end of RAGBRAI at Fort Madison's Riverview Park. 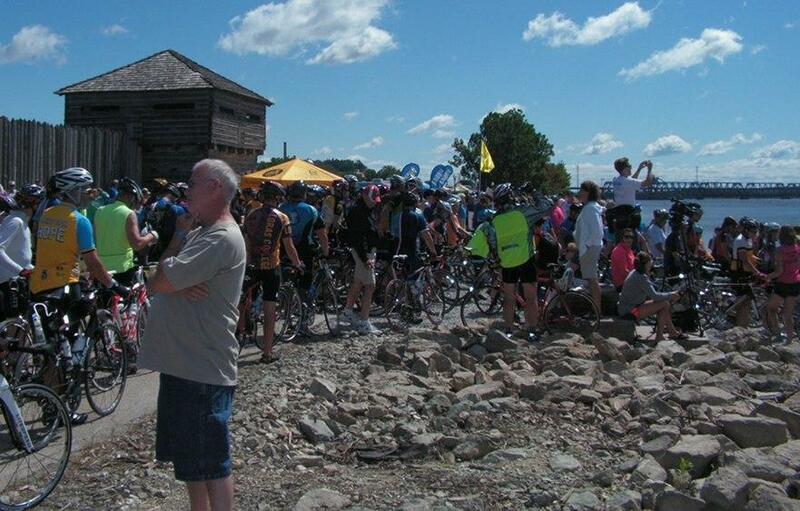 The line at Fort Madison's boat ramp for cyclists to dip their tires in the Mississippi. Alan Sanborn ending RAGBRAI his way, courtesy of Taekwondo skills learned at Iowa State University. 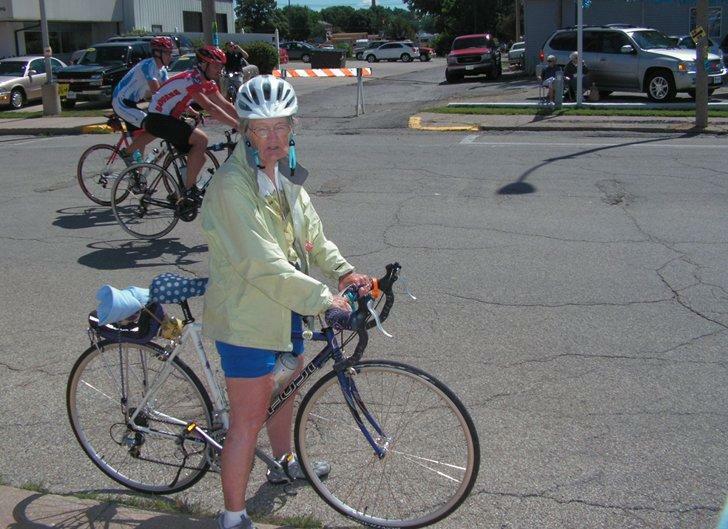 Margaret Paulos rode in the first RAGBRAI and in this year's. 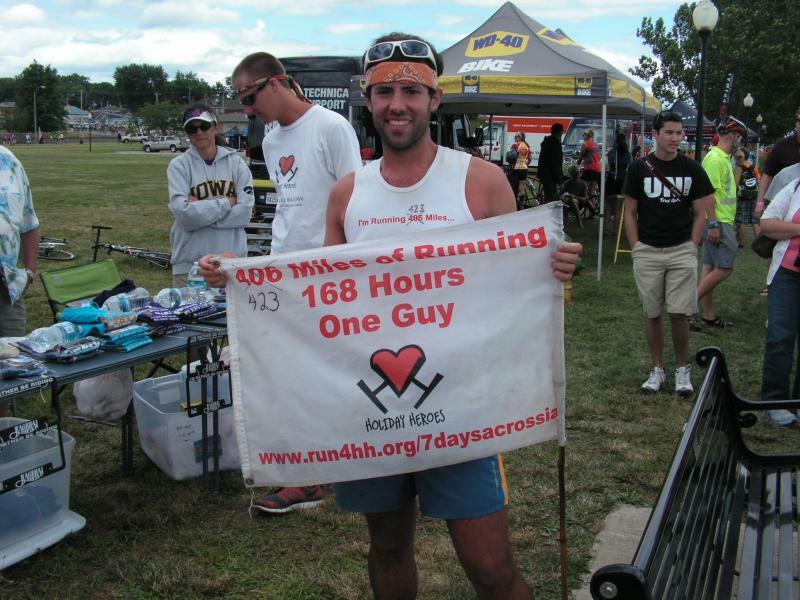 Pete Kostelnick ran the entire RAGBRAI route, including the Karras Loop. 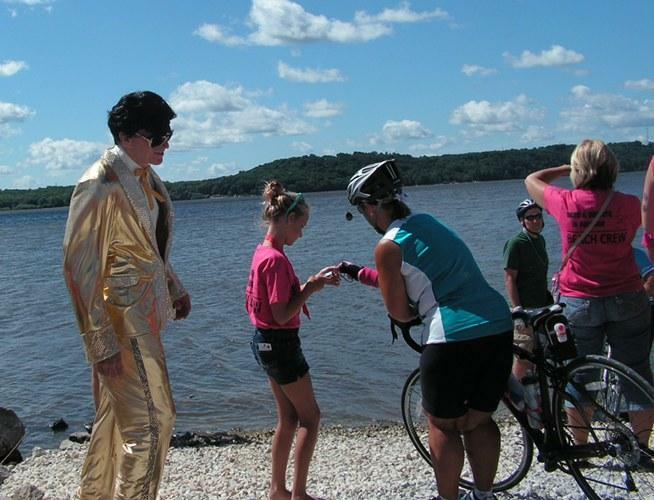 Elvis on hand to help riders dip their tires in the Mississippi River. One of the things that keeps the Register’s Annual Great Bike Ride Across Iowa (RAGBRAI) going is that it attracts people from inside the state and outside -- sometimes way outside. This year's RAGBRAI ended Saturday in Fort Madison, and at 9:30 am Matt Knapp was already done with his ride. He stood where the route crossed the railroad tracks before entering Riverview Park. Knapp, who flew into Iowa from Hawaii to take part in RAGBRAI, watched the riders coming around the bend to see if the rest of his team had made it. Regardless of who made the final turn, he cheered them on. “From Council Bluffs to Harlan this year people were doing this with the one finger up in the air," Knapp said as he gestured with his index finger. Since RAGBRAI started in 1973, many traditions have formed. Perhaps the most well known is that riders dip their back tires in the Missouri River at the start of the ride and they dip their front tires in the Mississippi when they finish. Many did just that in Fort Madison, and many also posed for pictures while lifting their bikes, tires up, above their heads. Alan Sanborn of Duluth, Minnesota did something a bit different. He asked one of the many volunteers wearing pink shirts to take his picture. Then in a single smooth motion he lifted his bike with one hand and dropped into a full splits, with one foot sliding just into the water. Sanborn is originally from near Waterloo, Iowa and went to college at Iowa State University. He said the reason he could do the splits was that he did "a lot of martial arts" while at ISU. It was Sanborn's 8th RAGBRAI. He said he did his first to get back into shape. One person who did not dip his tires in the river is Pete Kostelnick. That's because he didn't have any tires to dip. He ran the entire distance, which his GPS said ended up being about 427 miles. Kostelnick said he lives in Lincoln Nebraska,but is originally from Boone, Iowa. He was running to raise awareness for the charity “Holiday Heroes” which gives seriously ill children birthday and holiday parties. Kostelnick said that in order to keep going each day, he had to eat 8,000 calories. Some of that came from energy bars and pasta, but not all of it. One rider who was able to keep up her motivation for years was Margaret Paulos, who rode into Fort Madison in the mid-morning. She said she's been involved with RAGBRAI since its inception. 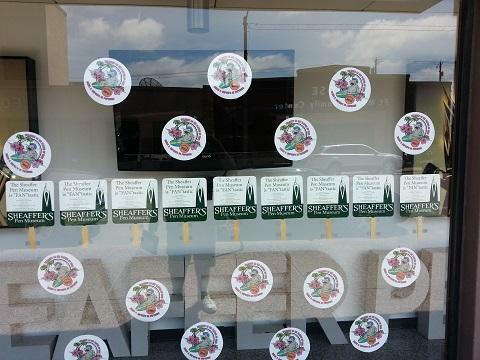 “Yes, the first year when they came into Davenport our little bitty Quad City bicycle club came out to meet them. So I count that,” she said. Paulos said she realized then, she just couldn’t stop. “You get into bicycling and you absolutely get addicted to it. It’s like runners you have to do it," she said, "And then, Iowa is so gorgeous and every part of the state is beautiful." Paulos said she wasn’t the only one in her family who got addicted. Her son Rick rode all of the first RAGBRAI. She said she started by ferrying station-wagon loads of riders and equipment and then started riding more and more of the RAGBRAI route until she rode the whole thing. For others who like Paulos, who are addicted, the RAGBRAI website has already started the countdown, down the second, to next year’s ride. 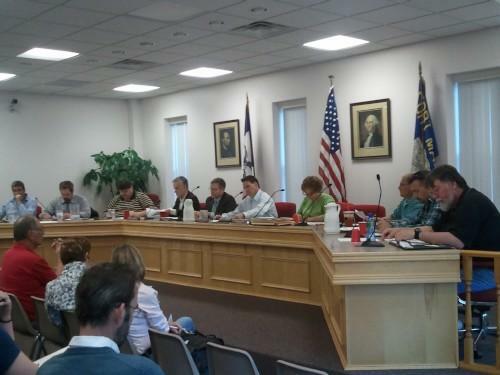 Fort Madison wants to prove it will be fiscally responsible. 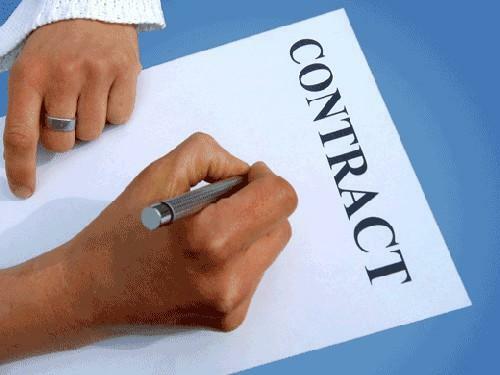 Fort Madison has wrapped up contract talks with four employee unions.